Vadra has repeatedly denied allegations of possessing illegal foreign assets and termed them a political witch hunt against him. New Delhi: Robert Vadra, the brother-in-law of Congress chief Rahul Gandhi, on Wednesday denied owning properties in London during his first round of questioning by the Enforcement Directorate which lasted for five and a half hours, according to sources. Vadra was being questioned by the ED in its money laundering probe into alleged possession of illegal foreign assets, days after he was directed by a city court to appear before the central probe agency. Vadra was asked to give in writing if he does not know of any such property in London and Sanjay Bhandari. The ED warned Vadra that any false information by him would invite legal action against him, said media reports. Following his questioning by the probe agency, Vadra’s lawyer Suman Jyoti Khaitan said that the former has given an undertaking that he will appear before the ED when summoned. “All charges against him are wrong. We will cooperate with the agency 100 per cent,” Khaitan added. 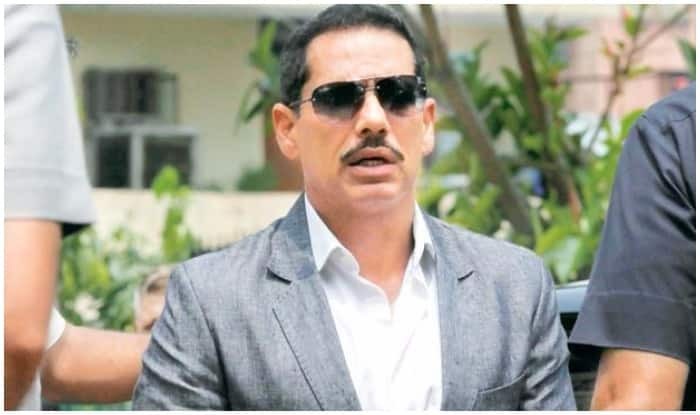 According to sources, Vadra will again have to appear before the ED at 10:30 am on Thursday for the second round of questioning in connection with the money laundering case. This is the first time he is appearing before any probe agency in connection with alleged criminal charges of dubious financial dealings. He was put through a dozen questions on transactions, purchase and possession of certain immovable assets in London and his statement was recorded under the Prevention of Money Laundering Act. Vadra has repeatedly denied allegations of possessing illegal foreign assets and termed them a political witch hunt against him. Vadra has alleged he was being “hounded and harassed” to subserve political ends. He was directed by a Delhi court on February 2 to cooperate with the investigation being carried out by the ED after he knocked at its door seeking anticipatory bail in the money laundering case. Vadra’s wife Priyanka Gandhi accompanied him in a white Toyota Land Cruiser and dropped him outside the ED’s office in Jamnagar House, in a move seen as sending a political message to Congress’ opponents ahead of Lok Sabha polls. Shortly after, Priyanka took charge as AICC general secretary in-charge of Uttar Pradesh East, a fortnight after her formal induction into the Congress party on January 23. “He is my husband, he is my family…I support my family,” Priyanka said in a show of support to Vadra, who returned from London earlier in the day. Priyanka was asked by newsmen at the All India Congress Committee(AICC) headquarters whether she was sending any message by dropping her husband at the ED office for questioning. Asked if it was a political vendetta, she said everyone knows why this is being done. “…It is the success of the will of the Prime Minister Narendra Modi-led government, when a gentleman hailing from a well-known family had to submit before the law,” Prasad said when asked about questioning of Vadra by the ED. Hitting out at Vadra, the BJP alleged that he got “kickbacks” from petroleum and defence deals during the UPA dispensation. BJP spokesperson Sambit Patra alleged at a news conference that Vadra bought 8 to 9 properties in London from the money he got as kickbacks from a petroleum and a defence deal which took place in 2008-09 when the UPA was in power. Patra did not provide any evidence to back up his claim. A local Congress leader Jagdish Sharma, questioned by the ED in this case few weeks ago, was present outside the agency’s office after Vadra went in. Talking to newsmen, Sharma alleged that Vadra was being “framed” in the case. The ED had also carried out raids in the case in December last year and grilled his aide Manoj Arora, an employee of a firm linked to Vadra, Skylight Hospitality LLP. The agency had told the court that it filed the money laundering case against Arora after his role cropped up during the probe of another case by the Income Tax Department under the 2015 anti-blackmoney legislation against absconding arms dealer Sanjay Bhandari. It had alleged that the London-based property was bought by Bhandari for 1.9 million GBP and sold in 2010 for the same amount despite incurring additional expenses of approximately 65,900 GBP on its renovation. “This gives credence to the fact that Bhandari was not the actual owner of the property but it was beneficially owned by Vadra who was incurring expenditure on the renovation of this property,” the ED had claimed before the court. Arora was a key person in the case and he was aware of Vadra’s overseas undeclared assets and was instrumental in arranging funds, the ED had alleged. Vadra has also been directed by the Rajasthan High Court to appear before the ED again on February 12 in connection with another money laundering case being probed by the agency. Vadra's lawyer said that the former has given an undertaking that he will appear before the ED when summoned. Vadra was directed by a Delhi court on February 2 to cooperate with the investigation being carried out by the ED. Vadra's wife Priyanka Gandhi accompanied him in a white Toyota Land Cruiser and dropped him outside the ED's office. Vadra was asked to give in writing if he does not know of any such property in London and Sanjay Bhandari.